We were incredibly disappointed with The Water Horse: The Legend of the Deep, and found it to be completely in appropriate and overly-violent. 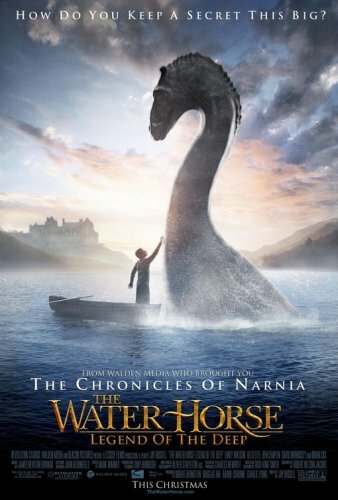 We had very much looked forward to going to see The Water Horse – the story of a young boy named Angus MacMorrow (played by Alex Etel) who finds an egg, from which hatches a Water Horse – a legendary, presumed mythical creature, whom he names “Crusoe”. From all of the previews, it looked like a thoroughly adorable movie, with no hint of the violence of the ending. Even all of the many reviews we found gave no hint at the violence in the movie. Many of them noted that it was set “during the war” or “war time”, but not a single review explained the endless shooting of huge guns and cannons – often times at the Water Horse, nor the “ruthless, trained killer” soldiers billeted at the home of Angus, his sister Kirstie (Priyanka Xi) and mother Anne (Emily Watson) – including one who, with countless evil smirks directed at the young boy, was set on finding and killing Crusoe. Finally, at the end, after Crusoe gets away from the barrage of cannon shots lobbed at him (and it is not at all clear that he will), and you feel great knowing that he has survived, the last 2 minutes make it clear that he is, in fact, no longer alive, despite having escaped. All in all, a great premise of a movie was rendered thoroughly inappropriate, disappointing, and sad. If you feel that you must see this movie, wait for it to come out on DVD – and save your money to go see Enchanted at the theatre instead.